The Pearl River is the third longest river in China. This river has increased Guangzhou's appeal as a popular tourist spot. A large number of the city's sight-seeing spots are close to this river. This 2,129 meter long river can provide you enough entertainment that will make your stay in the city an unforgettable one. There are quite a few legends that discuss the naming and origin of the river. According to some, the name Pearl River suggests the cumulative stretch of the North River, the East River, the West River, and Liuxi River. 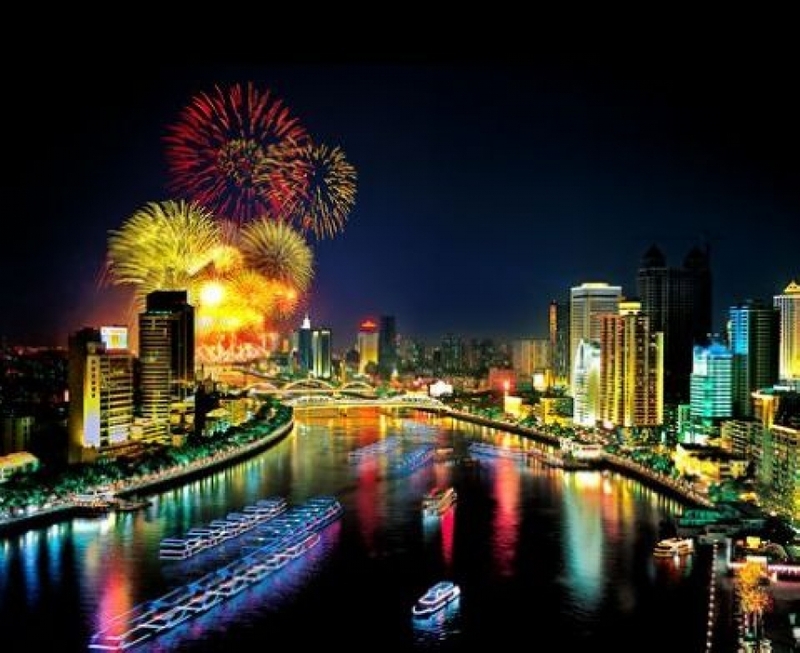 The part of the stretch that flows through the city of Guangzhou is called the Pearl River. In fact, this city is the meeting place of those four rivers. Another legend states that during its passage, the river crossed a rock island, making it as smooth and shiny as a pearl. Since then, the rock got the name "Sea Pearl Rock", while the river was named as the "Pearl River". A third legend states that an Arabian merchant came to this city with a stolen pearl from his country. The Arabian ruler sent his men to recover the stolen property. His men succeeded in their operation, but on their return journey, the pearl fell into the river. Thus, the river got its name while the pearl transformed into the "Pearl Rock". There are ten bridges on this river. These bridges are called Haizhu, Renmin, Luoxi, Haiyin, Zhujiang, Jiefang, Guangzhou, Jiangwan, Hedong, and Huanan. Four of these ten bridges are newly built ones, which are Huanan, Jiangwan, Jiefang, and Hedong. You will also find the Zhujiang Tunnel on this river. These bridges and the tunnel connect the south and north banks of the river with the district of Fangcun. The most famous activity on this river is the River Cruise. Though you can avail the cruise at day time, it is the night time cruise that is more exciting. At night, the river - along with its vistas, looks like a fairytale land. You can enjoy the view of the illuminated banks of the river from the cruise. The route of the night cruise begins at the White Goose Pool and covers the distance up to the Guangzhou Bridge and Baihedong or White Crane Cave. While the bridge falls on the eastern side, the cave is on the south. As if to accentuate the beauty of this night cruise, the cruise is run under the names of "Night Moon over the Goose Pool" and "Red Heart of the Pearl River". Even if you go for the day one, you should also try to fit in the night cruise into your travel itinerary. It will surely create one of those once-in-a lifetime moments for you. Most of the star rated hotels are near this river. So, if you board any such hotel, you can reach the river in no time. White Swan Hotel, Guangzhou Hotel, and Aiqun Hotel are all located beside the river bank. During your river cruise, you will also see some office buildings and skyscrapers, whose lights will remind you of the ancient light houses. So, if you have not included this river cruise in your travel schedule yet, then you should do it now.